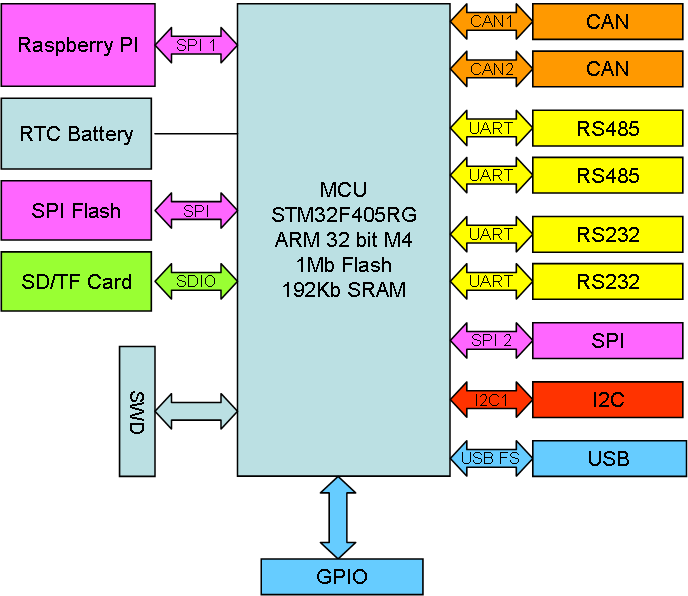 Replace F105 with the faster and more capable F405 including 1Mb Flash, 192Kb SRAM, ticking at 168Mhz with an ARM 32-bit M4 core. This change will allow Python and .NET to be used as well. Add a RTC w/battery connector. Add a SD/TF Card. I will use a 4 bit MMC version. 4 x Serial ports. 2xRS485, 2x RS232 or TTL. My first thought is 2 x RS485, 2 x RS232 and 1 x TTL, but lets see. SPI, I2C and available pins as separate extension port. Maybe even throw in a UART TTL here. Limit leds to 1 or 2 pin’s max. We can signal through blink sequences. I have the pins to do this, so it remains to se if the space of a Raspberry PI Hat will allow for this. I will need to use 3 sides with JST Micro connectors for this one. PSU here will either be USB or RPI Connector, but I will add a 2 pin 5V power as well.